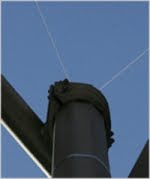 The Mishnah and Gemara (Eruvin 61b-62b) states that gentiles cannot be part of an eruv but need not be. Technically, their presence within an area does not require their participation in an eruv. However, on a rabbinic level, two or more Jewish families who live in an area shared by gentiles must rent permission from the gentiles to use their property. As it happens, my front walkway is shared with my gentile neighbors but since we are only one Jewish family, we do not have to rent permission. Because this rental is only a rabbinic requirement added onto the generally rabbinic laws of eruvin, the requirements for rental are low. The Gemara allows a weak rental (sekhirus re'u'ah) and permits rental of even just the right of a worker to place items on the gentile owner's property. You are also allowed to rent permission from a worker or government official who has some rights to enter the land without the knowledge or consent from the owner. Rishonim debate whether rental can also work for a Jew. The Rosh (Eruvin 6:13) rules that it works while the Rambam (Mishneh Torah, Hilkhos Eruvin 2:16) rules that it does not. The Shulchan Arukh (Orach Chaim 380:3) quotes both views and the Magen Avraham (ad loc. 6) and Mishnah Berurah (ad loc. 13) are lenient. However, acharonim debate whether, even according to the lenient view, a "weak" rental works for a Jew. Can we rent the rights from a worker or government official, or do we have to go straight to the owner? R. Chaim Na'eh (Ketzos Ha-Shulchan 105:26) is lenient but most are strict (e.g. Avnei Nezer 45:10). According to them, you must obtain the consent of the owner, or at least cannot go against his explicit refusal. What, then, if he doesn't like the idea of the eruv and refuses to be a part of it? R. Yehudah Leib Graubart (Chavalim Ba-Ne'imim vol. 1, Responsa no. 5) quotes R. Chaim Berlin who in turn quotes a ruling of the Atzei Almogim (391:3) that nowadays renting from the government is particularly effective. Tosafos (Bava Basra 55a sv. I'm) writes that in a place where taxes are levied based on the property, the government has a lien on the house and is considered its owner, to a degree. Therefore, the government has sufficient ownership over the town's houses to give permission for the eruv. This would solve all problems of Jews who choose not to participate in the eruv. The government is sufficient to authorize participation. R. Baruch Simon (Imrei Barukh on Eruvin U-Reshuyos, pp. 212-213) quotes R. Yoel Wosner who holds that the government's right of eminent domain, to seize anyone's property, is sufficient to consider the government an owner of the property. Therefore, as above, the government is authorized to rent out property of both Jews and gentiles for eruvin purposes.